As January, 2014 drew to a close, much of N America had a shock beyond the record breaking cold. The most recent snowfall would not melt, but smoldered and blackened under flame. The burning snow went viral on the Internet. 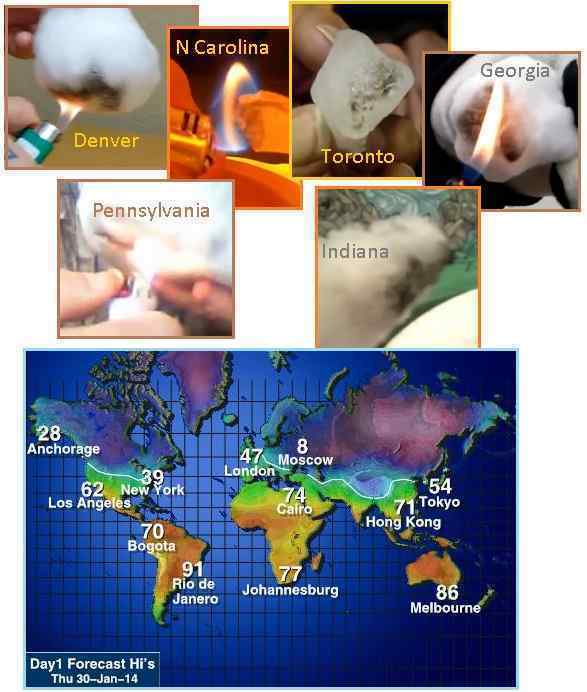 On January 30, 2014 burning snow was recorded on video and distributed via YouTube from Denver , Pennsylvania ,Georgia , Toronto , Indiana , and North Carolina among dozens of other sites as an astonished public checked to see if their snow, too, would blacken but not melt. Per the Zetas the burning snow is due to chemical components in the Stratosphere pulled down by what the weathermen were calling the Polar Vortex over Canada and the US in January. If left alone, these components would evaporate and return to the Stratosphere, but when lit, they chemically combined with H²O to form a type of plastic. The snow smelled like plastic too, especially when burned. ZetaTalk Explanation 2/1/2014: Snow or rain will certainly wash particulates and chemicals out of the air, as is known. After a rain, the air will seem fresh, free of dust or pollen. When a heavy snow pack melts in the spring, the snow along the sides of the roads becomes almost black with the residue that had been within the snow, now concentrated so visible. What is causing this recent phenomena across those portions of the US recently affected by what the weathermen are calling a polar vortex, voracious cold fronts from the Arctic swooping in a circular manner into the midwest thence south and east. This vortex activity is of course Earth wobble driven, with the globe divided into regions that are either too cold or too warm. Where central and eastern US has experienced a polar Winter, Europe has experienced an early Spring, and Alaska is often warmer than Florida. What happens to volatile chemicals released into the air when the jet stream is forced down into low pressure areas? Yes, these volatile chemicals are products of the chemtrail activity, which the wealthy elite employ to mask the presence of Planet X. But these chemicals are also residue from car emissions, coal and gas fueled power plants, and numerous other industrial activities as well as greasy elements in the tail of Planet X. Clearly, the polar vortex that dropped snow on the US in the days preceding January 30, 2014 pulled these volatile chemicals into the snow that covered most of the US. What happens when this mix is subject to being heated by a flame? Where water, i.e. melted snow, is expected, the H²O combines chemically with the other chemicals to create something akin to plastic. Plastic, after all, is created from petrol products, so this result should not be surprising. Does this mean that the snow will be poisoning the soil and ground water? These volatile chemicals will evaporate as the snow melts, returning to the stratosphere, leaving no apparent residue. 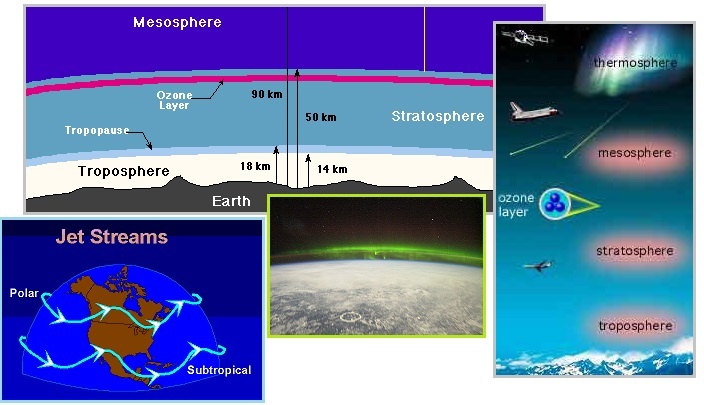 The Stratosphere is the atmospheric layer above the one we humans breathe. The Jet Stream lives in the Stratosphere, and has been distorted by the Earth wobble since Planet X arrived in the vicinity in 2003. Thus, it is no surprise that it took a dip during the polar vortex of January, 2014. With the discovery of the Stratosphere, scientists could better define the area in which weather occurs. This helps to gain a better knowledge of the processes required to develop weather phenomena such as thunderstorms and tropical cyclones. Jet streams are fast flowing, narrow air currents found in the atmospheres of some planets, including Earth. The main jet streams are located near the tropopause, the transition between the troposphere and the stratosphere. The major jet streams on Earth are westerly winds (flowing west to east). Their paths typically have a meandering shape. ZetaTalk Prediction 5/5/2005: The temperature and density and direction of air masses can be determined, and thus the weatherman has historically offered predictions, but these predictions have become increasingly difficult, in part because of the Earth wobble which jerks the Earth about under her mantel of air, often at cross currents to the jet stream. More of this will follow, as the Earth wobble is not going away or lessening its grip. It will, quite the contrary, proceed to more horrors. Tests made on the burning snow proved that this snow indeed contained an oily substance! Multiple people in multiple locations experienced dramatically different results when attempting to singe their snow. From the plethora of tests we have seen already, it is quite clear that snow in many areas is not acting identical to snow found in other areas. The toxicity varies from location to location, based on countless factors. Sublimation Purification cuts the flame out of the equation, uses heat to vaporize the water, and what is left is a crystalline structure that takes a long time to melt, and when it finally does, an observable oily residue remains on the surface of the water. The Zetas state that the burning snow is not caused by chemtrails, in the main, but by all the other pollutants we humans produce on a daily basis. Just look at the smog over Beijing and LA lately, and the collective emissions from coal and gas burning power plants, to imagine the cumulative effect. China's state media have called for environmental improvements in unusually frank discussions of the country's pollution problem, as thick smog continues to shroud Beijing and other cities. Just about anyone who has been on a plane in the daytime descending into Los Angeles has seen that lovely brown layer of haze covering the sky. Electricity generation is the dominant industrial source of air emissions in the United States today. Fossil fuel-fired power plants are responsible for 67 percent of the nation's sulfur dioxide emissions, 23 percent of nitrogen oxide emissions, and 40 percent of man-made carbon dioxide emissions. 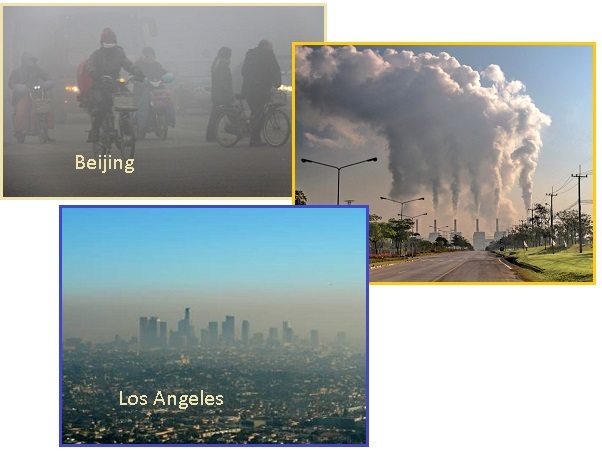 These emissions can lead to smog, acid rain, and haze. The grease in the tail of Planet X also has an effect! This grease has put halos around the Moon and created noctilucent clouds from the chemicals in the tail, all since Planet X arrived in the vicinity in 2003. ZetaTalk Prediction 2/15/2002: In early 2002, a distinct halo around the Moon became noticeable, and this is directly related to increased ash in the atmosphere. But as the shift approaches, such halos will become more commonplace, surrounding the moon, bright lights, and cease to receive comment as even more disturbances distract troubled mankind. ZetaTalk Statement 1/24/2008: There are different chemicals in the atmosphere of Earth at this time than have been in the memory of man. 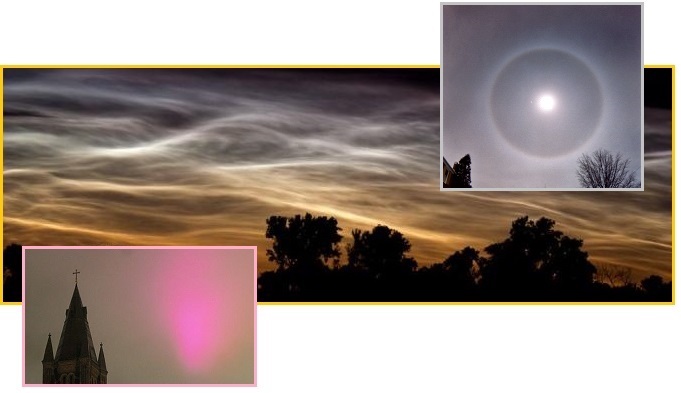 It has been only during the past couple years, since the arrival of Planet X into the inner solar system, that Moon halos have been noted, or odd neon clouds. ZetaTalk Explanation 10/25/2008: We have stated in the past that occasional neon clouds or light pillars were due to atmospheric changes from the tail of Planet X. This would not be occurring without chemicals from the tail of Planet X mixing into the atmosphere. Such displays will become more common.